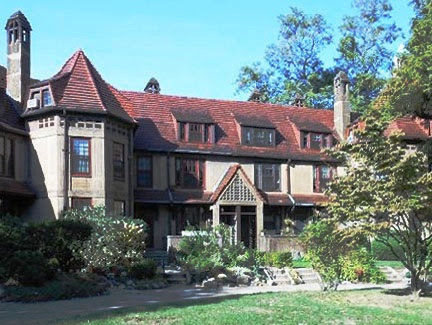 For years a group of homes within the Forest Hills area have sometimes been referred to as “Pomander Walk”. Since I had no idea what this alluded to, the inner historian detective in me did a little digging. Back in the day when Forest Hills Gardens was a new community, a local theater group evolved in 1916 calling themselves The Gardens Players. They were not affiliated with any organization. They gave performances during the warmer seasons in what was then known as the Tea Garden, the neglected plot of land behind the Forest Hills Inn Apartments. During cooler seasons performances were held at The West Side Tennis Club. But one of the plays performed by the Garden Players took place in the cul-de-sac group of attached homes on Burns Street, an area just off of Station Sq. The story of this production is based on neighbors living in a quaint circular group of townhouses in Georgian London. The play’s name was, you guessed it, Pomander Walk, written by Louis N. Parker. In 1910 it premiered at Broadway’s Wallach’s Theater, a building which is long gone. The natural setting of real houses and a real tree……made the Burns Street group a literal “Pomander Walk.” It will never be called anything else. But the plot thickens. There’s another Pomander Walk on the upper West Side of Manhattan. In 1920 Thomas Healy, a famous nightclub operator known as “the restaurant man”, was at the height of his fame. He acquired an irregular plot of stretching from 94th to 95th Streets between Broadway and West End Avenue. So now if and when you ever care to take a stroll through Forest Hills and you hear reference to Pomander Walk, you’ll know the meaning behind its name.